Maura, being a second child, always inherits the hand-me-downs from her older sister, be it clothes or toys. She doesn’t seem to mind it, but does get especially excited when she gets something just for her. This is why she’s thrilled with her VTech InnoTab 3S that we’ve been testing out for the past few weeks! It has lots of games and activities already installed – 20 – so she could practically play it straight out of the box. All the creative options that are at her fingertips – coloring pages, picture-taking and fun editing with the camera, and the video recorder! Music! She can listen to her favorite mp3s. The calendar. She can add notes to it, just like mommy. It’s rechargeable, because buying batteries is so expensive, not to mention wasteful. And the battery life is pretty good! You can increase its memory via a micro SD card. Plenty of space for all the videos and pictures Maura takes, and tons of music. Hundreds of games are available for download from the VTech store, so she’ll never get bored. You get one free with your initial purchase of the InnoTab. Every game has an educational component. No mindless, addictive apps. It’s built to withstand a kid’s tough play. Sturdy and well-protected, It’s been dropped quite a few times, juice splashed on the screen, etc., and it’s no worse for wear, which makes it great for travel. The stylus. It allows Maura to practice writing and drawing with an actual instrument, as opposed to her finger. And it’s attached to the tablet so it won’t get lost. Kid Connect is definitely our favorite feature. With this service, kids can send texts and stickers to their parents’ smartphones in real time, and vice versa, whether they’re in the next room or across the country visiting grandparents. Maura can only ‘connect’ with people that I approve, so I can rest assured that she is only communicating with people I know and trust. The InnoTab 3S comes with a one year free subscription of Basic Kid Connect. Signing up for it was easy. I just registered within the Learning Lodge software (which you download to your computer when you set up your InnoTab), then installed VTech Kid Connect on my iPhone, signed in, and started messaging! We upgraded to “Kid Connect Premium” to take full advantage of all it has to offer. With this upgrade, in addition to texts, Maura can send photos, drawings (like the one to the right), and even audio messages from her InnoTab 3S to my phone! So far, there have been a lot of “I love you” messages, heart drawings, and sweet audio recordings. This is going to be especially valuable when my husband and I go away next weekend, to celebrate our anniversary. Maura will be able to get in touch whenever she wants, and I’ll be able to hear her precious voice anywhere I want. And at other times she can’t stop giggling! A lucky TDB reader will win an InnoTab 3S from VTech! To enter to win, please fill out the Rafflecopter widget below. US residents only. 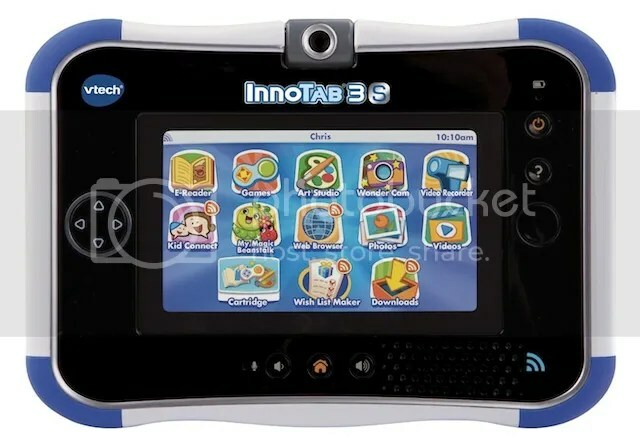 Disclosure: We were provided with an InnoTab 3S and a free Premium Kid Connect subscription by VTech to facilitate this review, but all opinions are my own. I was just looking at these for my granddaughter! Would rather win one then buy one. lol. I would love to win this for both my son and daughter! I would like to win this for my 5 yr old son, but his 3 yr old sister would enjoy it too. I’d love to win this for my daughter. She just had her second Leap Pad break on her and needs something different. My oldest son really want this!!! I would like to win this for my son, he always likes to play with his dad’s iphone. This is more kid friendly and I think he would enjoy it. I would like this for both my son and daughter. I have 3 kids, they would all LOVE this!! For my oldest daughter and I’m sure my youngest will be using it also in no time :). I would like to win for my son for xmas! My daughter is a bit old for it and my son a bit young, so I’d save it for my son’s next birthday! I would like to win it for my daughter. I would love to win this for my Goddaughter. I’d love to win this for both my son and my daughter! I would love this for my granddaughter, Anna. I would like to win it for my niece. I would love to win for my son! He would love this! I’d love to win this for my boy/girl twins! I would love to win this for my daughter. Thanks for the great giveaway! My bigger kids would LOVE this!!! They are 8, 5 and 3! Thanks for the chance! Annie´s last blog post ..Don’t Forget Your Rainbow Loom! Would get this for my granddaughter. I’d love to win for my goddaughter, I think it’d be something fun for her to use to pass time during her chemo treatments and other appointments. I would love to win for my grandkids!! My daughter loves my IPhone and I think this would be much better for her to play with! I’d love to win for my 4yo son! Would love to win this for my granddaughter! I’d like to win this for my grandson Orion. Thanks for the giveaway. My son! He has been asking me to get the InnoTab for him for Christmas! I’m entering to win for my youngest niece! I’d love to win this for my daughter! She would just love it as she is obsessed with everyone’s smart phones and tablets. This is a product I’d trust since she is still very young! I would love to win it for my 7 year old daughter! My good friend Brandon would love it! I would love to win this for my best friends daughter, Annabella! I would love to win for our granddaughter. I’d get it for my younger daughter and younger son. I would really like to win this for my niece. She would be thrilled to get this as a gift. It would be for my little boy! I would like to win this for by son. I would like to win it for my niece and nephew, hopefully they will share. My niece and nephew would love to get one of these! I would love to win the VTech InnoTab for my little grandson. He’s our little “Techie”! I’d love to win for my nephew! I would lvoe to win this for my youngest son. I would be so blessed to win this for my niece! This would definitely be going to my daughter. She wants one so much but its a bit out of our price range this year with our new litle guy on the way! I hope to win this for my grandson. Would love to win for my nephew Conner. I’d like to win this for my youngest son. Thanks! I want to win this for my favorite nephew! I’d love to win this for my three sons for Christmas. Thanks for the giveaway! I would love to win it for my nephews. I’d like to win this for my 2 great grands. I watched the Youtube video. I learned the device has 4gb of memory and you can expand it to 32gb with a micro usb. I would love to win this for my 6 year old son.I know my 3 older kids would also “borrow” it from him to play. I’d like to win for my two kids. I would love to have this for my kids (2 and 4) to share! I would love to give this to my grandkids. I would like this for my youngest daughter. She put a tablet on her Santa list. I would LOVE to win this for my daughter, Ella! I would love to be able to gift it to my granddaughter for Christmas. It would be for my daughter Trinity!